want to reach us? check out our website! cover photo A massive iceberg, as seen from one of the Ocean Endeavour‘s zodiacs in Ilulissat Icefjord, a UNESCO World Heritage Site and must-stop on Adventure Canada’s Arctic expedition starting in Nunavut (page 31). with SPEECH RECOGNITION Certified Dragon® Medical Software Training Speakeasy Solutions provides personalized and dynamic training -- offered by industry leaders with over 16 years of experience working with speech recognition technology. Get the most out of your Dragon Medical Practice Edition investment with professional training and support. Contact us today and secure the most dramatic return on your investment with Speakeasy Solutions training and support services. ce. Snow. Sleet. Wind. Waves. Swells. A heady brew of Mother Nature’s power is on full display in the High Arctic. Here, you can have a taste of winter— year-round. These elemental forces are humbling and bewitching, and remind us to “tremble with joy,” as Arctic explorer Knud Rasmussen wrote. The isolated land of the Arctic has many stories to tell, from bygone colonialday explorers of the British Admiralty to modern-day Inuit forging a life on the very edge of civilization. And after a few days aboard the Ocean Endeavour with Adventure Canada, everything seems to shift, expand, deepen…from Nunavut to Greenland, the journey through the Northwest Passage is like bearing witness to the planet’s history (page 31). Another soul-searching trip can be found thousands of kilometres away, far from the Arctic Circle and near the Equator. Belize is becoming a hotspot for adventure seekers, from jungle to beach. The back-to-nature experience with Island Expeditions—camping on the fringes of untouched cayes, hiking and snorkelling amidst strange creatures, kayaking in the great blue beyond of another ocean—is about discovering yet another side of Mother Nature (page 16). There’s a north-south, hot-cold, dark-light dichotomy in all things. And in this issue prefacing the winter season, we showcase both, whether qiviut (the softer-than-cashmere fibre of the Arctic’s musk ox; page 6) or the circular perfection of the Great Blue Hole (page 5). We meet Aurora borealis, that glowing lady of the north (page 6) and then sample margaritas in the desert heat of Phoenix (page 21). We travel from the Southern Hemisphere in Antarctica (page 8) to the UNESCO World Heritage Site of Ilulissat Icefjord on the northwest coast of Greenland (page 38). As per a quote our photography expert shares from Mark Twain: “…throw off the bowlines. Explore. Dream. Discover.” Yes. We do it with gusto in this issue. Enjoy. Any ideas, comments or questions? Reach us at feedback@InPrintPublications.com. haunt the hole’s depths, but I’m afraid of real creatures like the stingrays and blacktip sharks that make their homes here. Minutes ago I wondered if our boat had stalled, not realizing we’d arrived: the hole’s rim is hidden under a vast expanse of daunting dark water. Rodney dives down and points out colossal tube corals, along with strange black-and-white tiger tail sea cucumbers that shrink away when playfully prodded. It’s a glorious underwater garden with purple and gold coral seafans swaying to a soundless tune. if you go Take an excursion from Island Expedition’s Lighthouse Reef basecamp. islandexpeditions.com read more See story on Belize, page 16. 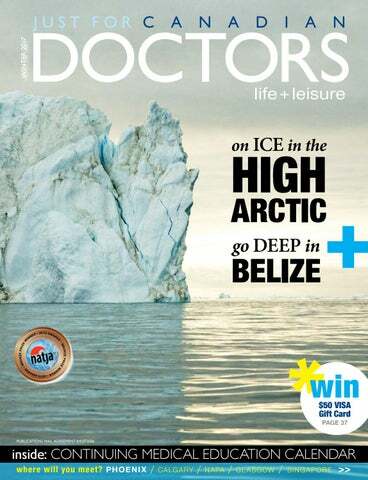 See story on the Arctic, page 31.
p h o t o p r e s c r i p t i o n m i c h a e l d e f r e i ta s Michael DeFreitas is an award-winning photographer who’s been published in a wide variety of travel publications. With his initials, MD, he’s been nicknamed “doc,” making his photography prescriptions apropos. Apply your photography skills to the shooting situations and scenery of the antarctic. Send photos and questions to our photography guru at feedback@ inprintpublications.com and your shot may be featured in a future issue! The US and Canadian Academy of Pathology invites you to become a better pathologist while enjoying these world class destinations. This historic conference will give you a chance to “ask the experts” and give you the tools you will need to implement these guidelines in your daily practice. Our experts will provide insights and expertise to help build your working knowledge for diagnostic cytopathology. Images and molecular testing will be presented in a clear and concise fashion. FEBRUARY 3-5 | 2017 This tutorial in genitourinary pathology by career educators provides a personalized mentoring opportunity that will positively enhance your daily practice, stimulate high performance and generate outcomes that benefit patient care. MARCH 4-10, 2017 The USCAP 2017 Annual Meeting is your opportunity to participate in a full-immersion learning experience. You’ll have the opportunity to learn from some of the biggest and brightest names in the field within a setting that promotes both interactivity and networking. Registration is now open. Make plans to be a part of this career-changing event. Use the mullions of a window and other props, or even ice formations, to frame your photography—and add another dimension to scenery. ones I fired away. I managed to get off about 20 shots before the whales disappeared into the depths. Some never got a shot. One of the main difficulties in the Antarctic is trying to avoid the ever-present white backgrounds making it tough to get frontal portraits of the birds. interactions during their feeding time. Bright sunny days are rare and fleeting in the Antarctic—another reason to have cameras ready at all times. Camera meters typically correct for neutral gray, rendering snowy scenes dirty or darkish especially in brilliant sunshine. Presetting your camera’s exposure compensation to +1 will help whiten the snow and bring out a bit more detail in the shadows. It’s also a good idea to utilize props to help augment the general monotone nature of Antarctic scenes. Think ahead about how to use the red survival parkas worn by crew and passengers, the red zodiacs or structures around the boat as frames or leading lines. My prop preparation paid off as we motored through the Lemaire Channel and got a fiveminute window of sun. Just enough time to dash to the bow and fire off a few shots before the clouds engulfed us. Two days earlier I had scouted a large oval iron cleat at the bow that I now used as a frame for my wide-angle lens. The Antarctic is one of the last frontiers. Plan for the unexpected. Take extra equipment and backups for everything. And, of course, expect to be wowed. Roberta Staley is an award-winning magazine writer and the editor of the Canadian Chemical News, published by the Chemical Institute of Canada. She is also a magazine writing instructor at Douglas College and a graduate student at Simon Fraser University. Build ingredients in a rocks glass. Add cubed ice and stir. Garnish with orange zest. It describes the soil and climate in which grapes are grown. But what about that other essential element? Water. Scottish company Uisge Source has taken terroir back to its historic roots. It’s reviving an old tradition in which whisky distillers gave small bottles of their source water to customers for dosing drams to open up the spirit’s aroma and flavours yet preserve the whisky’s character. Uisge Source sells 100 ml bottles of water from three Scotch distilleries in the Highland, Speyside and Islay regions. Champagne producer Moët & Chandon has also taken a look inward at its long history and quite literally raided its cellars to produce MCIII, an ultra-premium cuvée made of multiple vintages. This spring I was one of the first people in Canada to sample MCIII. Vintages ranging from 1993 to 2003 have been chosen to represent the wine’s “three tiers” or essential aging elements: metal (stainless steel vats), wood (oak casks) and glass (bottles). Still wine vintages compose the first and second tiers, while the third tier is a marriage of grand vintage champagnes from five to 10 years old. All three tiers of wines are blended together and aged for an average of 10 years, plus one year post-disgorgement. Complexity doesn’t even begin to describe this unique production process. And while MCIII is pleasing to my palate, it’s aficionados of the bubbly who will truly appreciate the nuances of this superb champagne. If you can get your hands on a bottle (it will set you back about $650), pop the cork and raise a glass. It’s an ideal way to toast a year of adventurous imbibing. Canadian distillers are also putting their stamp on spirits—with winning results. For instance, Odd Society Spirits doesn’t use wine barrels for its Barrel-Aged Vermouth but rather charred bourbon barrels. The vermouth is yet to be released to the public (at time of writing), but it’s already snagged a Double Gold medal and Best Vermouth award at the 2016 New York World Wine and Spirits Competition. The Vancouver-based distillery puts masses of botanicals into the mix, including bark foraged from local arbutus and cherry trees. Another BC distillery is getting into the spirit of using local ingredients and earning gold for its efforts. Queensborough Gin, made by Central City Brewers + Distillers, took home gold in the gin category at the 2016 San Diego Spirits Competition. Spruce tips foraged from Vancouver Island and mountain juniper berries from the province’s interior region give this classic London Dry gin its citrus notes and floral nose. The booming craft beer industry has long been known for taking detours from convention. Like Brew Loops, a celebration of the beer and bike culture (responsible biking, of course) in Kamloops, BC. This year’s event, which I participated in, introduced a pub crawl and block party—on bikes. Along with 100 other riders, I cycled and sipped my way from riverfront Pioneer Park to Red Collar and Noble Pig breweries and finished at the block party across the river, anchored by Red Beard. The café specializes in craft brews from BC and beyond. It’s a refreshing way to get a taste of a city’s local flavour along with a little of exercise. Terroir is another topic that constantly comes up, typically in the context of wine. ystery and history, science and alchemy, evolution and revolution. The world of beverages is both complex and compelling. I’ve fallen down many rabbit holes expanding my knowledge of all things quaffable from amaro to Zwack. This summer I strolled along the French Riviera with a Grey Goose Le Fizz Royale cocktail in hand. In a boulangerie bedecked in the apropos French blue, I sampled a slice of sourdough bread from the baker himself. It seemed like a strange pairing with my effervescent aperitif crafted from vodka, St. Germain Elderflower Liqueur and a splash of soda. And while this European reverie wasn’t exactly real (it was the Grey Goose Boulangerie Bleue event held in Vancouver), what I learned was revelatory. At first flush I failed to make the French connection between vodka and bread. But I realized that the faux wheat fields at the event weren’t just for photo ops. This French vodka, after all, is made from winter wheat, not potatoes. In fact, Grey Goose purchases wheat from a trio of French farming cooperatives that’s the same high-quality grade used for baking bread. Vive la différence! Another unexpected French twist was one of the event’s signature cocktails: the Negroni. Of course, the Negroni is not just the quintessential Italian cocktail, it’s also made with gin, not vodka. Surprisingly, the Grey Goose L’Orange vodka’s bittersweet and oily essence of citrus (almost half a kilo of fruit goes into each bottle) stands up to the sweet vermouth. The verdict: the French might be beating the Italians at their own game. Shake up your own (recipe below) and say à votre santé. D r . k e l l e n s i lv e r t h o r n Dr. Kellen Silverthorn is Just For Canadian Doctors’ automotive writer. He tries to keep one convertible and/or one track-day car in the family fleet. ix years ago I was one of a handful of journalists who showed up for the 20-minute press launch of Singer Vehicle Design. As I recall, minimal signage. No appies, nor libations, nor high-heeled models in formal wear. Just an aging exrocker passionate about his old Porsche 911, expensively modified to look even older (the car, not the rocker). I shook my head…but, as it turns out, for the wrong reasons. I made the mistake of judging Singer Vehicle Design’s prospects based on my perspective. The >$600,000 USD average price for one of their “restored, re-imagined, reborn” treatments of a customer’s old Porsche 911 resulted in exquisite, bespoke creations. But, as a Porsche 911 owner and fanatic myself, I just couldn’t see a market at half that price. that front, as the oily bits of their new ride are comprehensively restored to Type 964 specification or better. Depending on options, the brakes, suspension and engine are also far more advanced and higher performing than a 1973 vintage or even 1993 vintage. Of course, the casual bystander can’t see any of these upgrades curbside. What the astute bystander can see in Singer Vehicle Design’s re-born creations are subtle bespoke exterior and interior visual cues. Some of these borrow inspiration from the factory race-special Porsche 911s of the small-bumper era (911R, 911 S/T, 911 RS, 911 RSR). Other cues are musical, or from Catherine Wheel iconography. Others cues are just different, like two louvers on the Singer Vehicle Design Targa bar versus the three on the Porsche factory-minted item. And the planet’s 0.00000014% are lapping this up. In addition to US customers, Singer Vehicle Design has sold in Canada, Mexico, France, Switzerland, the UK, Russia, Dubai, Bahrain, Hong Kong, Taiwan, Korea and Indonesia. The company reports that buyers in the emerging markets are often Gen X or even Millennial, rather than the early-and-mid Baby Boomers who actually grooved to the small-bumper 911s as teenagers. The loyalty of these owners to Singer Vehicle Design is impressive. There’s no showroom, demo unit or even a show car. All of those roles are played by existing SingerVehicle-Design-creation owners. But it’s not quite like the inauspicious launch of six years ago. Singer Vehicle Design now gets invited to starring roles at the most prestigious auto-enthusiast events— Goodwood and the Quail Gathering to name just a couple. Many event attendees can recite the Singer Vehicle Design story verbatim. Unlike my prediction, fans flock. Wallets flap. Kool-Aid line forms to the left. You have to love the Dickinson storyline, though. “Follow your passion and great things will transpire.” The world could use more feel-good stories. I’ll pause and reflect the next time I’m tempted to shake my head at someone else’s dream. Choose from 2 Outstanding Meetings in ONE Great Location Hilton Orlando Bonnet Creek Please join us in Orlando this February to learn, network with colleagues and other industry experts, and also earn CME / CNE credits. NEO: The Conference for Neonatology addresses cutting edge, yet practical The conference aspects of newborn medicine. for neonatology Educational sessions are conducted by many of the foremost experts, who address neonatal-perinatal topics for which they have become renowned. Target audience: All neonatal-perinatal providers, including neonatologists, advanced practitioners and staff nurses. Target audience: Neonatologists, residents, fellows and advanced practitioners. For more info on exploring Belizeâ&#x20AC;&#x2122;s jungles and reefs, go to travelbelize.org. For excursions through Island Expeditions go to islandexpeditions.com. Read more about Belize and get a peek inside the famed Great Blue Hole on page 5.
little life at the research station today, just some lizards and hermit crabs. We tie up our kayaks near a weathered wooden jetty and slip on our snorkel gear. In minutes I’m immersed in an alien-looking underwater theatre of neon-yellow brain coral and plum-tinged coral fans waving in the waters. Mike pops his head out of the sea to shout out the names of the fish, like monstrous Nassau groupers, stripy sergeant majors, and stoplight parrotfish. “Stingray!” I spot the sand-cloaked diamond shape and its half-metrelong tail. The stingray captures water under its flat body and transforms itself into a magic carpet that does a quick disappearing act as we watch in wonder. After about 45 minutes of underwater exploration it’s time for lunch. I swim toward the jetty and come eye-to-eye with a sliver of silver. Barracuda. The metre-long fish is suspended in the shadows, razor teeth protruding from its hinged jaw. I retreat backwards and make my way to the jetty ladder. Mike and Budge prep a lunch of Johnny cakes with tuna salad, plus watermelon and cookies, to fuel us for our shortcut back to Southwest Caye. We outfit our kayaks with sails and let the wind fast forward us across the channel back to camp. Two days later, we’re onshore at our final outpost, Lighthouse Reef, a deadringer for Glover’s, but bigger and wilder. Everything here is in constant motion. Saltwater sprays our tents facing the churning sea, rangy palms gyrate in the gusts and black frigate birds fly overhead like kites. Jack Wilde, the camp naturalist, gives our group a quick orientation: we’re sharing the island with members of the Belize Audubon Society, a colony of 3,000 red-footed boobies nesting in the native ziricote trees and hundreds of hermit crabs scrabbling about. I spend the next four days dining on a pirate’s bounty of adventure: hand-line fishing with a piece of conch on a hook, ogling massive nurse sharks lying in repose and kayaking two-metre swells to explore a rusty ship heaped on the reef. And under the grin of a crescent moon and the Big Dipper scooping up a million twinkling stars, I slip a flashlight onto my wrist, walk into the sea and plunge my face into Belize’s deep, dark beyond. brewery and gastropub, Angel’s Trumpet Ale House 4 (angelstrumpetalehouse.com). Every first Friday night of the month, thousands of people gather in revitalized RoRo for the First Friday Art Walk. At the nearby Phoenix Public Market Café (phxpublicmarket.com), art comes in the form of local food, from coffee roasted in nearby Tempe (try the Desert Dawn: oj and a splash of lemon topped with cold brew coffee) to “Eat the Rainbow,” a combo of farmers’ market veggies (and cool t-shirt 5 ), or the Arroz & Frijoles bowl, a healthy, heaping, hipster take on southwestern fare. More foodie inspiration is found uptown at The Yard, at the graffiti-art-clad Barrio Urbano (barriourbanophx.com). It’s an urban take on traditional Mexican cuisine by Chef Silvana Salcido Esparza 6 , a four-time James Beard Award nominee, where craft cocktails 7 and killer tacos come together in an atmosphere that’s part gritty barrio and part art gallery. And it’s yet another way of finding that desert zen. — Barb Sligl For more info on Phoenix, go to visitphoenix.com, for nearby Scottsdale, check out experiencescottsdale.com, and for Arizona, visit visitarizona.com. Limited places available for our 11th biannual conference, May 14-20, 2017: “Controversies in Perioperative Medicine" a unique fully accredited, multi-disciplinary CME program with an international faculty. Target and reach new customers with marketing solutions from Canada Post. It’s easy to create effective direct mail campaigns on any budget with Snap AdmailTM, our fast and easy online tool. Or connect with an experienced Direct Mail Partner in your area to get expertise and advice that’s specific to your business and campaign. Trademark of Canada Post Corporation. d o c t o r o n a s o a p b o x d r . c h r i s p e n g i l ly Dr. Chris Pengilly is Just For Canadian Doctors’ current affairs columnist. Please send your comments to him via his website at drpeng.ca. 1. Scope of activities, regulations, training requirements and/or limitations differ between jurisdictions. Please refer to the pharmacy regulatory authorities for details. 2. Initiate new prescription drug therapy, not including drugs covered under the Controlled Drugs and Substances Act. 3. Alter another prescriber's original/existing/current prescription for drug therapy. 4. Pharmacists independently manage Schedule 1 drug therapy under their own authority, unrestricted by existing/initial prescription(s), drug type, condition, etc. 5. Applies only to pharmacists with additional training, certification and/or authorisation through their regulatory authority. 6. Authority to inject may not be inclusive of all vaccines in this category. Please refer to the jurisdictional regulations. 7. For education/demonstration purposes only. 8. Ordering by community pharmacists pending health system regulations and/or infrastructure for pharmacist requisitions to labs. 9. Authority is limited to ordering lab tests. 10. Pharmacy technician registration available through the regulatory authority (no official licensing). Home of the Canadian Light Source Synchrotron Saskatoon is home to the Canadian Light Source. The Synchrotron is a unique national resource and the largest Science project in Canada in more than 30 years. The City Saskatoon Shines – with more hours of sunshine than any other major Canadian city. With a population of 255,000, Saskatoon is the largest city in Saskatchewan, boasting small town spirit and big city amenities, an International airport, world class events, with a strong arts and music focus. The city is noted for its outstanding walking and biking trails along the riverbank, and excellent educational facilities, including the University of Saskatchewan. What's more everything is within 20 minutes of home. THE COMMUNITY OF CHAPLEAU is seeking ONE FAMILY MEDICINE PHYSICIAN to join an established RNPGA Our clinic and hospital is located in Chapleau, Ontario, a friendly and open community with rich character in both English & French traditions. The town has a population of approximately 2,779 and is nestled in the heart of the Canadian Shield with access to provincial parks and year-round recreational activities. If you’re looking for a great work-life balance in a friendly community, come and visit. AC wing (13 beds), LTC wing (25 beds) and ER department ensure all basic services are met. Patient care is integrated with the Chapleau & District Family Health Team and the numerous programs and clinics that are offered. The position follows the Rural Northern Physician Group Agreement. Emergency and Hospital call arrangements are shared equally between four physicians. The Chapleau community recently achieved the highest possible level of Accreditation with Exemplary Standing from Accreditation Canada. For Family Physicians interested in a challenging opportunity and settling in an area where they can enjoy an exceptional quality of life, Northeastern Saskatchewan offers vibrant, rural communities with superior access to a wide range of recreational activities all year long. Kelsey Trail Health Region is an active, family-oriented health region known for a multitude of recreational opportunities, exceptional schools and rural hospitality. We’re offering a forgivable loan along with housing and a vehicle allowance. behold. In Karrat Fjord we pass a limitless variety of giant shards, all calved off glaciers stretching out from Greenland’s massive ice cap. I snap photo after photo but it’s pointless, for each berg is a wholly new wonder, like trying to capture a snowflake. After not being able to land due to thick fog hanging between ice-bedazzled sea and towering mountains (for Greenland is like a lacy fringe of jagged peaks wrapped around its icy core), the ship turns around to continue south. We circumnavigate a city-block-sized iceberg and the scenery gets more and more dramatic. The culmination is in Ilulissat at the mouth of a 56-km ice fjord into which icebergs calve from the most productive glacier in the northern hemisphere—some bergs the height of the Empire State Building and size of Prince Edward Island. “Ilulissat” means icebergs in Greenlandic, and this UNESCO World Heritage Site, which produces enough ice in one day to provide New York City with drinking water for an entire year, is a frozen wonderland. Ironically, we end our expedition where most of those polar explorers started in search of the Northwest Passage. It’s a surreal bit of backward reel, starting from the jeweltoned tundra and whale-like rock formations of western Nunavut, through the rocky archipelago of islands named for erstwhile men and their brethren (Prince of Wales, King William, Somerset and even Boothia, named for Booth’s Gin, the sponsor of Ross’s long-ago voyage) to the cliffs of Devon and Baffin Islands and then, on the other side of Baffin Bay and Davis Strait, the jagged coastline of Grønland and its fairytale-like icebergs. In Ilulissat I look for a tupilak, a totemic carving of avenging creatures once used by shamans. Small, fitting in the palm of my hand and made of caribou antler, this piece of Inuit art is both exotic and somehow utterly familiar. I think of a passenger’s comment overheard on the top deck shortly after the Greenland coast first came into sight: “This is the most savage land I’ve ever seen.” Yes, savage. And katjaarnaqtuq. “It’s beautiful.” A savage beauty that few witness. Once witnessed, much like this mercurial land itself, something shifts inside. I grasp my tupilak and wait for my soul to catch up. be available to the pharmacists. Maybe I am being naïve in thinking that pharmacists will recognize their limitations. The table on page 29 shows the wide diversity of pharmacists’ services across Canada. Alberta is leading the way and has not encountered any significant problems. have all green ticks. I do have some reservations about the very top line if it really means “any schedule 1 drug,” and clearly other provinces do as well. I feel that expanding the service of pharmacists is a pragmatic and needed change in healthcare delivery. This change underlines the need for collaborative groups, virtual or real. DOES YOUR BAG grab attention? make you stylish? help cure malaria?
! e r e h d a r u o y Use this space to deliver your message to 28,000 doctors across Canada. the “well baby care” and immunization program is conducted by Public Health, routine PAP tests and “well woman” examinations are done by The Woman’s Clinic, contraceptive management is dealt with by The Sexual Health Clinic and innumerable minor problems are dealt with at walk-in clinics. It would be safer to have communication between all these diverse bodies—but, alas, there is not. A motivated and well-trained pharmacist could deal expeditiously with many patient concerns after hours and on weekends. This would take some pressure off the walk-in clinics as well as allowing primary-care physicians to get a reasonable amount of time away from the office. sudoku Solve puzzle #2 for a chance to win a $50 VISA gift card! Each sudoku puzzle has a unique solution that can be reached logically without guessing. Fill in the grid so that every row, column and 3x3 square contains the digits 1 through 9. Complete schedule available on our website. Visit www.cme365.com for online courses and information on LIVE webcasts for credits. Yes, I would like to receive the CME newsletter & updates by e-mail. NB: Information collected will not be shared with any third party. 1. Entry form must be accompanied with solved puzzle. Only correctly solved puzzles entered into random draw. 2. Send puzzle + entry form to Just For Canadian Doctors, 200 – 896 Cambie St., Vancouver, BC, V6B 2P6 or fax 604-681-0456. Entries must be received by February 24, 2017. 3. Prize: $50 VISA Gift Card. 4. Contest can be changed and/or cancelled without prior notice. 5. All entries become property of In Print Publications. 6. Employees of In Print Publications and its affliates are not eligible to participate. wish you were here on the west coast of Greenland, 250 km north of the Arctic Circle, you can stand at the edge of the Ilulissat Icefjord. This UNESCO World Heritage Site is the only spot (other than Antarctica; see page 8) where you can watch a massive ice sheet, glacial ice-stream and calved icebergs empty—in real-time, hi-def drama—into a fjord. See story on the Arctic, page 31. Course Fees may vary based on number of hours offered. Please visit our web site for current fees and cancellation policies. Selected Cruises listed here. See a complete Program Listing at www.ContinuingEducation.NET Accreditation: Continuing Education, Inc is accredited by the Accreditation Council for Continuing Medical Education to provide continuing medical education for physicians. Designation: Continuing Education, Inc. designates these live educational activities for a maximum of 14-21 AMA PRA Category 1 credits™. Physicians should claim only the credit commensurate with the extent of their participation in the activity. a division of Global Tracks, Inc.